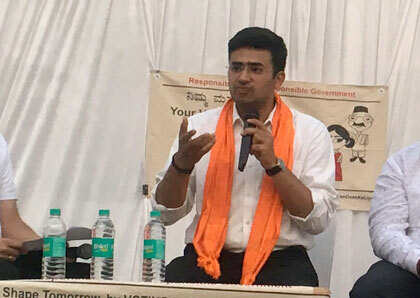 Tejasvi Surya is the Bharatiya Janata Party candidate for Bengaluru South. At 28, he is one of the youngest candidates in this Lok Sabha election. At an interaction with residents of a housing society in Bengaluru, Surya -- who is fighting his first parliamentary election -- tells voters about himself and what they can expect from him as their MP.